Rainfall Irrigation Inc. provides a variety of irrigation products in Powder Spring, GA.
Rainfall Irrigation Inc. in Metro Atlanta and surrounding areas offers a variety of irrigation products. These products can help conserve your water, save money and time in the long run, and never over or under water your lawn. Learn more about our great products listed below. MP Rotator’s apply multi-trajectory, revolving streams slowly and evenly, especially when adjustments have been made to the radius and the arc. It helps water to soak on slope and clay-like soil surfaces, instead of letting it run off and become wasted. Better wind-resistance, less misting, and handling reclaimed water are additional water-saving advantages that MP Rotators provide. The drip irrigation targeting method can be used for virtually any watering need, including potted plants, hanging baskets, trees, ground cover, and shrubs. They work great for both large and small watering areas dispersing equal amounts of water to all the plants. Drip systems are also an invaluable commodity when propagating a hillside or an inclined region because they allow the water to percolate deep to the roots rather than runoff. 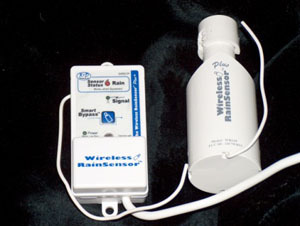 This technology helps make sprinkler systems truly automatic and can fully integrate with any sprinkler system. It prevents watering when rainfall has already done the job. 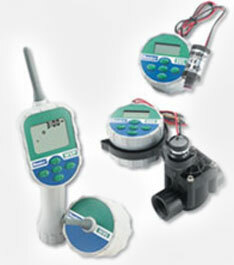 It includes completely integrated and adjustable freeze protection. It is easy and quick to install with no special tools required. Water conservation becomes more important as our population continues to grow at a rapid pace. 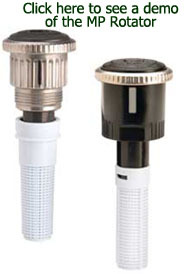 To further help the conservation of water, we provide bubblers and bubbler nozzles. Where the traditional source of electrical power is lacking, battery operated controllers are needed. Battery operated controllers benefit sites that have to do without an automatic irrigation system. To find out more about the products we offer and which one would be right for you, please don’t hesitate to call us today. Copyright © Rainfall Irrigation Inc., 2014. All rights reserved.